Crossfire Power? Compact design with no loss, with entertainment and performance: that is how the HP Pavilion m6-1050sg is described on the HP website. 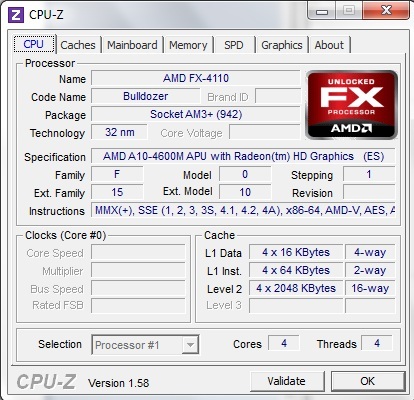 The AMD quad-core A10-4600M APU with the Radeon HD 7660G + 7670M dual graphics card is supposed to provide the performance needed. Are there really no losses? A couple of months ago, computer giant HP flooded the market with a number of new releases. The HP Pavilion m6-1050sg was one of them and attracts attention especially because of it dual graphics solution. 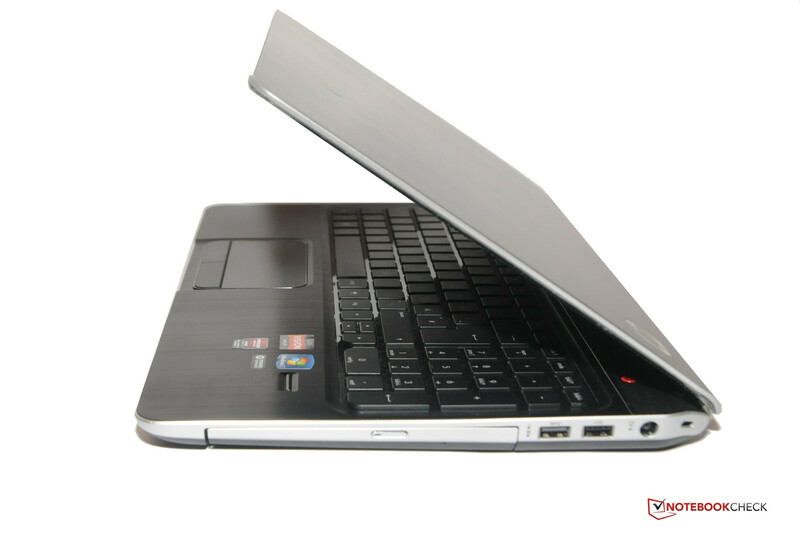 The multimedia notebook is equipped with the quad-core processor AMD A10-4600M. The processor, based on Trinity architecture, has a basis clock rate of 2.3 GHz, which can be increased up to 3.2 GHz thanks to the AMD Turbo-Core 3.0 technology. The dual graphics solution based on the AMD Crossfire technology with the Radeon HD 7660G in the graphics card, integrated in the APU, as well as the dedicated AMD Radeon HD 7670M, are the basis for the graphics performance. Both graphics cards calculate a picture differently allocated in the AFR (Alternate Frame Rendering) mode. The 15.6-inch display is mirrored and has a maximum resolution of 1366x768 pixels. The HP Pavilion m6-1050sg operates with an 8192 MB DDR3 as main memory. The Toshiba hard drive has a capacity of 640 GB and only manages 5400 rpm. The following review reveals how the multimedia notebook performed in our test. The HP Pavilion m6-1050sg is only available in black with some silver areas. The aluminum and chrome housing looks posh and classy at the same time. However, the stability of the 15.6-inch notebook leaves much to be desired. Especially toward the middle of the notebook, the material tends to bend heavily under light pressure. The display lid is not much better. It is very thin but can be easily bent. The display hinges fulfill their duty rather moderately, a significant bouncing was noticed. With a height of 25mm, our test model is just above Intel's upper limit to be labeled an ultrabook. Fair enough, HP provides the user with relatively easy access to the inside of the notebook. Furthermore the battery can be removed easily. Weighing 2.4 kg is perfectly normal for a notebook of this size. We could not find any sharp edges or poor transitions in the 15.6-inch computer housing. The HP Pavilion m6-1050sg has all necessary connections. There are three new USB 3.0 ports plus an additional older USB 2.0 port. The multimedia notebook even includes a finger print reader. The combi-connection, serving as headphone output as well as microphone input, has a rather negative rating, because normally this means that only a headset with matching adapter can be used. Our test model was also lacking a dummy for the card reader, which is located at the front of the notebook. The allocation of the connections is perfectly fine, left-handed may complain about the numerous sockets on the left-hand edge at the front area during usage. 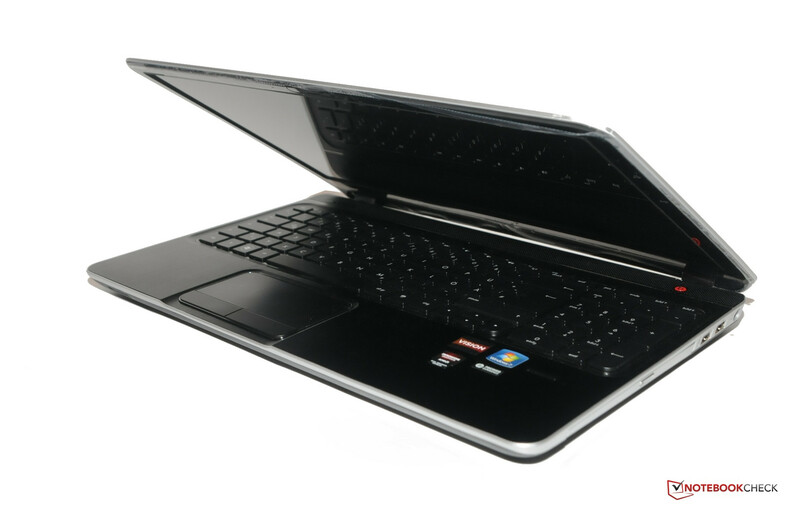 The communication modules of HP's 15.6-inch notebook meet current standards. Gigabit LAN is provided by Realtek RTL8168/8111. The Broadcom 802.11n covers all common WLAN standards. The HP Pavilion m6-1050sg provides Bluetooth version 4.0. A UMTS module is not included in the multimedia notebook. As usual, the accessories are quiet lean. Apart from the notebook with its power adapter, there are no extras. Even separately, extra accessories are not offered for the HP Pavilion m6-1050sg. 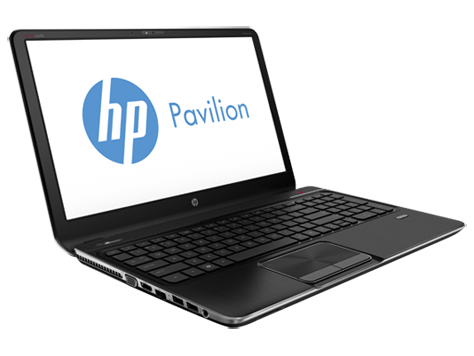 HP provides their customers with a two-year warranty for the Pavilion m6-1050sg. This includes a pick-up and delivery service. At additional costs, the type of warranty and its duration can be extended. HP offers a three-year care pack support for this notebook for 165 Euros (~$213), including pick-up and delivery service. For 237 Euros (~$307), there is a three-year warranty as well, but with accidental damage protection (pick-up and delivery service). The manufacturer's website provides further information about extension of warranty. 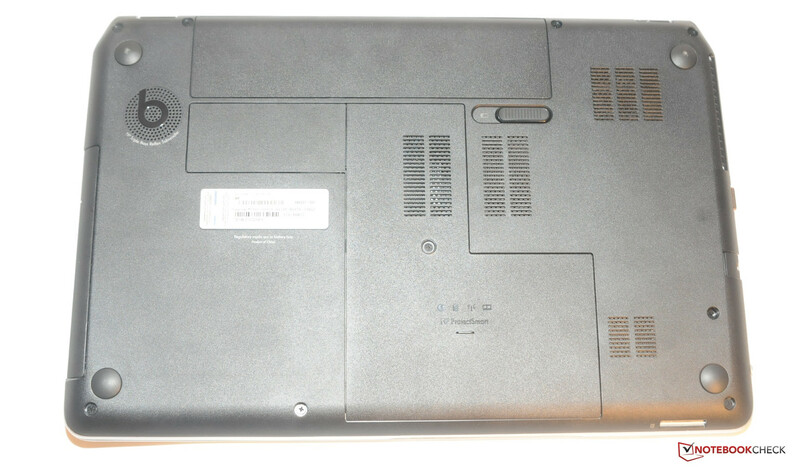 The HP Pavilion m6-1050sg provides the user with a chiclet keyboard including a complete numeric pad. The built-in keyboard has a size of 15 mm x 15 mm. Altogether, this keyboard resembles the one of the HP Pavilion dv7 a lot. The key drop is very pleasant, although the key stroke is a bit too soft. The clicking sound during typing is barely audible. In addition to the great deformation towards the middle of the keyboard, the very small arrow keys "up" and "down" are subject to criticism. This will affect gamers in particular. For writing, however, the input device is perfectly fine. The built-in touchpad convinces as well. The sensitive pad, which is clearly detached from the wrist rest by a lowering, is sufficiently large with its 11.5 cm diameter. The mouse replacement supports multi-touch gestures without any problems and the fingers can glide over it well. The two matching mouse-buttons are perfectly fine too. It has a rather short key drop; the pressure point is clearly defined and accompanied by a discreet clicking sound. 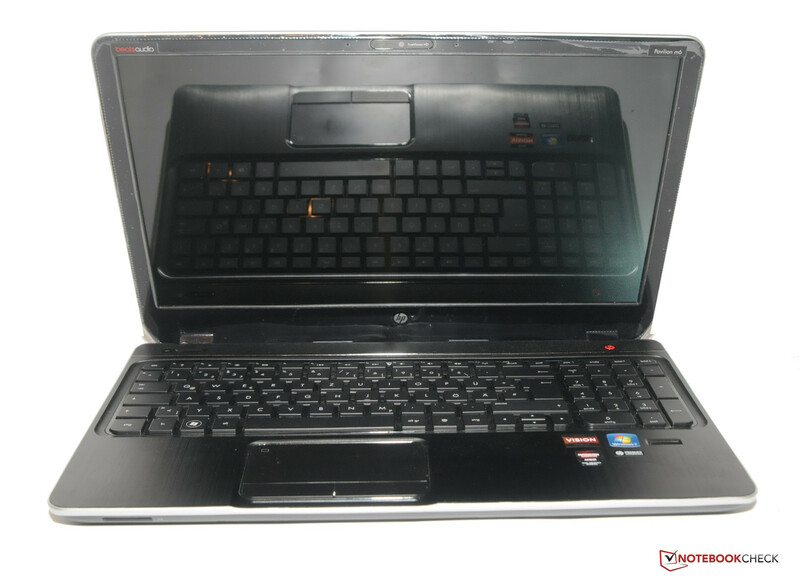 One important factor for choosing a multimedia notebook is doubtlessly a good display. The HP Pavilion m6-1050sg uses a 15.6-inch screen. Unfortunately, the display is light reflecting, making outdoor usage difficult. Maximum native resolution is about 1366x768 pixels. We measured the brightness of the built-in monitor with the Gossen Mavo-monitor. The result was rather disappointing: maximum illumination measured was 155.9 cd/m². The average was only about 155.9 cd/m². To compare: the HP Envy 15-3040nr offers up to 266 cd/m². At least, the brightness does not decrease during battery mode. The illumination is well balanced with 94%. The measured black level is about 0.93 cd/m², resulting in an average contrast 172:1. Altogether, these results are hinting towards a quite cheap display. We compared the color space of the display with the sRGB color space. 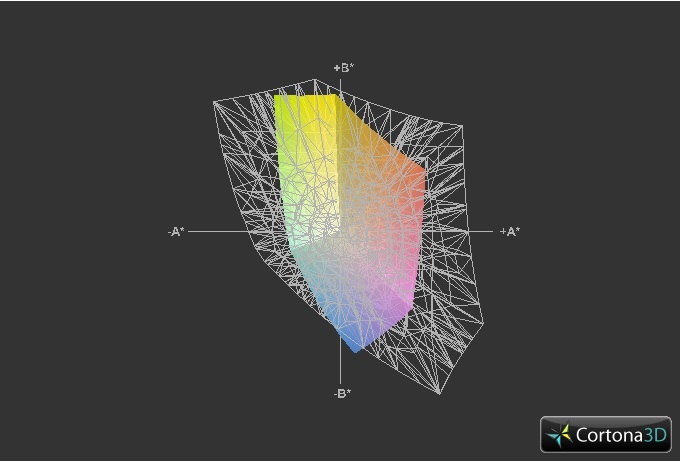 The alongside graphic clearly demonstrates that the sRGB color space is only rudimentarily covered. This does not really matter, as the color space coverage only matters for professional graphic designers. Using this multimedia notebook outdoors is rather difficult. The reflecting display as well as the weak illumination badly affects the outdoor usage. The stability of the viewing angle of the HP Pavilion m6-1050sg also leaves much to be desired. While the picture collapses quickly and massively with vertical deviations from the ideal angle, it still is acceptably stable horizontally. The photomontage clearly points out the viewing point stability. We took pictures from the notebook from different perspectives with the same aperture and shutter speed in a dark room. The backbone of our test model is the AMD A10-4600M. The quad-core processor is based on the Trinity architecture and is supposed, thanks to the AMD Turbo-Core 3.0-technology, to manage a rate of up to 3.2 GHz. However, in our tests the HP Pavilion m6-1050sg achieved maximum 2.8 GHz. 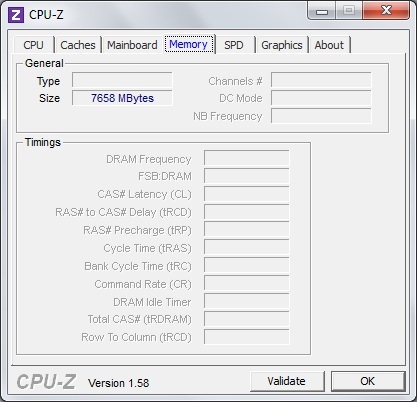 The basic clock rate of the fastest product of the A-series is about 2.3 GHz. The thermal design power in the manufactured 32 nanometer notebook APU is stated as 35 Watts by the chip producer. A special feature of our 15.6-inch large test model is the dual graphics resolution based on the AMD Crossfire technology. 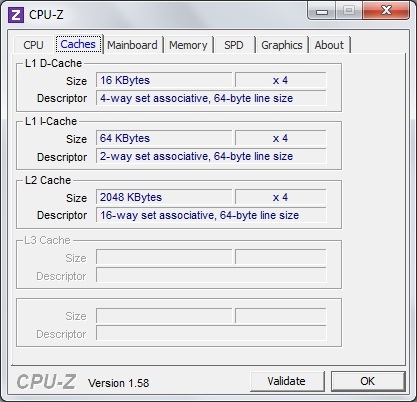 Besides the Radeon HD 7660G, integrated into the APU, the dedicated AMD Radeon HD 7670M graphics card is applied too. Both graphics cards calculate the to-be-displayed pictures in AFR (Alternate Frame Rendering) mode. Due to the applied technique, the performance can be a tiny bit choppy. See a special site of Notebookcheck for further information. Different intervals between two pictures make them visibly shake even though enough pictures per second are calculated in theory. The HP Pavilion m6-1050sg has 8192 MB DDR3 memory as main memory. HP decided to go for a 640 GB large Toshiba hard drive. The HDD with the product description MK6476GSX only performs 5400 rpm. As usual for Notebookcheck, we tested the CPU performance of the quad-core processor with Cinebench R10 and Cinebench R11.5. In the older version, our test model achieved in rend. multi test (64bit) 8043 points. Therefore, the HP Pavilion m6-1050sg reached the same level as the other notebooks with the same processor, for instance the Acer Aspire V3-551G-10468G50Makk (8096 points). The 15.6-inch Fujitsu Lifebook AH532 is operated by the Intel Core i5-3210M (2.5 GHz) and scored 10989 points in the same test. Things look similar in Cinebench R11.5 too. Here the 15.6-inch notebook reached exactly 2 points in the multi-test. With its AMD A10-4600M, the 17-inch HP Pavilion g7-2051sg reached 1.98 points in a direct comparison and the Fujitsu Lifebook AH532 2.89 points in the same test. During the entire test, the HP Pavilion m6-1050sg did not manage to succeed the 2.8-GHz rate, even though a performance of up to 3.2 GHz (1 core) would be theoretically possible. To test the performance of the entire system, we apply the known benchmark software PCMark Vantage as well as PCMark 7 of Futuremark. In daily usage, the multimedia notebook works fairly smooth. But what results did the benchmark tools reveal? Under PCMark Vantage, our test model scored 5466 points and therefore is almost as good as its bigger brother HP Pavilion g7-2051sg (5552 points) in our benchmark database. Further behind is the Acer Aspire V3-551G-10468G50Makk with the same CPU and GPU. The notebook, which is also 15.6-inch, scored only 4951 points in this test. The bad CPU turbo as well as the slow hard drive are to blame. The Fujitsu Lifebook AH532 (Intel Core i5-3210M / NVIDIA GeForce GT 640M LE) was clearly ahead of our test model with 7157 points. Under the current PCMark 7, the differences between the Acer notebook and our test model are not so severe. The multimedia notebook of HP is leading with 1864 points (Aspire V3-551G-10468G50Makk 1844 points). In comparison to both AMD versions, the Fujitsu Lifebook AH532 is clearly ahead (2165 points). As already mentioned, the HP Pavilion m6-1050sg uses a 640 GB Toshiba hard drive. The HDD with the product name Toshiba MK6476GSX manages 5400 rpm. 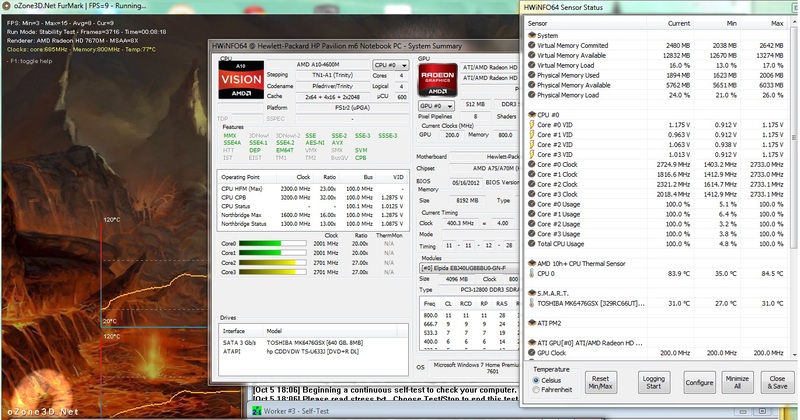 We analyzed the HDD performance with HD Tune. 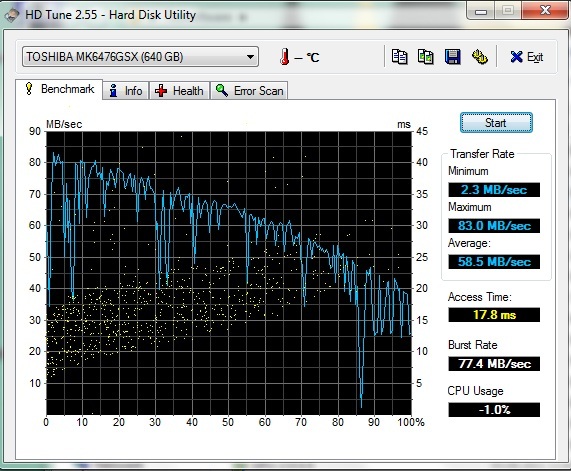 The average transfer rate was about 58.5 MB/s, placing the hard drive in the lower middle of our benchmark data base. A HDD with 7200 rpm or even an SSD would be much faster. The multimedia notebook Asus N56VM, which operates with a 750 GB hard drive (7200 rpm) from Seagate, is a positive example. The average transfer rate is about 90.1 MB/s, representing an increase in performance of about 54%. The Sony Vaio SV-Z1311Z9EX shows us what is currently possible. Under HDTune the notebook with a 256 GB Samsung RAID SSD manages an average transfer rate of 951 MB/s and therefore is sixteen times faster than our test model. At a costly price of 2500 Euros (~$3238), the 13.1-inch notebook is in a completely different price range. For further information about the performance of HDDs and SDDs, please have a look at our special site. We tested with the known 3dMark series by Futuremark how the dual-graphics resolution performance based on AMD Crossfire technology looks like. Under 3DMark Vantage 6548 points was achieved. This clearly places the multimedia notebook ahead of the Acer Aspire V3-551G-10468G50Makk (5995 points) with the same CPU and GPU. 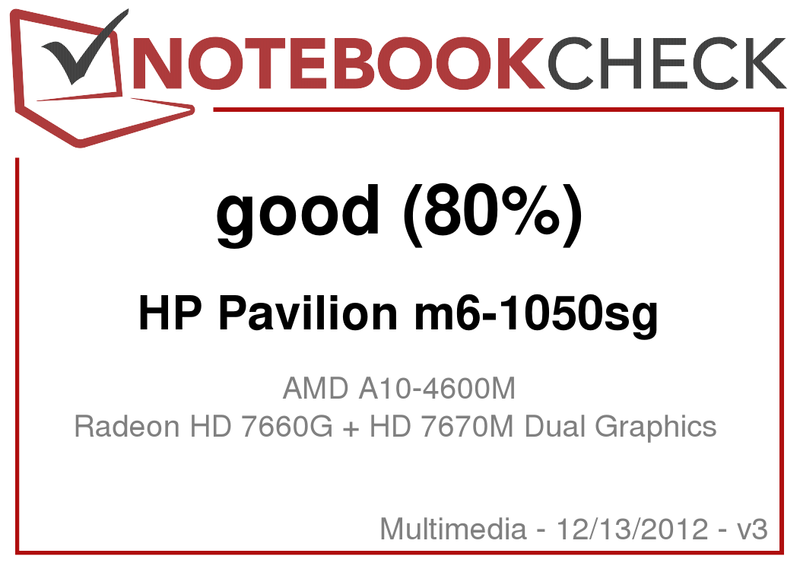 The 17-inch HP Pavilion g7-2051sg is a bit better than our test model (6655 points). In the current 3DMark 11, the HP Pavilion m6-1050sg is leading among all notebooks with identical processor and graphics configuration with 2065 points. The 15.6-inch Acer Aspire V3-551G-10468G50Makk, for instance, only reached 1988 points. The practical gaming ability was separately tested with a couple of current games. Being equipped with the AMD A10-4600M quad-core processor as well as the dual Crossfire graphics resolution should mean that current games should run without any difficulties. We tested this with some current as well as older games under realistic conditions. Up to the maximum native resolution of 1366x768 pixels and medium detail level, older games like Mafia 2 are no problem. With current games, for instance Skyrim, we measured 27 fps on average. Normally, a game should at least have 30 fps to run smoothly. Therefore our test model is just at the border. The Acer Aspire V3-551G-10468G50Makk performs Skyrim in this test with 33 fps, thus a bit better. The 15.6-inch Toshiba Satellite P855-107 reached around 40 fps with the Intel Core i7-3610QM processor and the GeForce GT 640M graphics card. 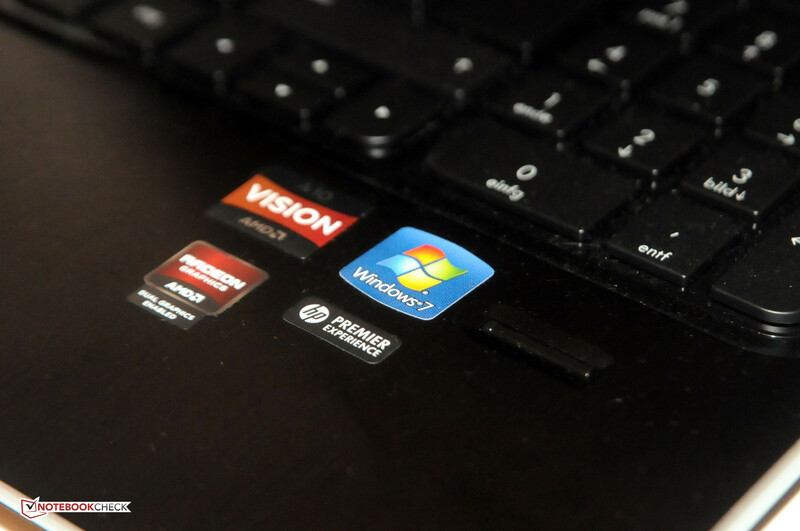 Going above the maximum native resolution is problematic with this multimedia notebook, a fact that does not matter too much as this can only be achieved with an external screen. To sum up, it is justifiable to say that the HP Pavilion m6-1050sg clearly reaches its limits with current games at a 1366x768 pixel resolution, but can perform older games without problems. Our special site lists what games work well with what graphics cards. Altogether HP's multimedia notebook runs relatively quietly. It does reach a noise level up to 37.2 dB(A) in idle mode (compared with: Acer Aspire V3-551G-10468G50Makk 33.4 dB(A)), the peak during high-demand tasks is not much higher. During high-demanding tasks, we measured 39.2 dB (A) as maximum, which doubtlessly can be heard but is not distracting in any respect. Does the relatively quite noise level come at the cost of the temperature development of the housing? When a low load is applied, such as when using Office, the answer is a clear "No". The surface of the notebook never exceeds 30 °C and the bottom never goes beyond 30.5 °C. But how are things when heavy load is applied? Here we can notice a significant warming of the surface of the notebook. After an hour-long non-realistic stress test with Furmark as well as prime95, the surface reached 42.1 °C, while the bottom heated up to 43.1 °C. The wrist rest remained considerably cooler with 35.1 °C. The adapter became a bit too hot with up to 53 °C. These scores are too high but we should not over interpret them. HP has a considerably worse example with its Pavilion g7-2051sg where the bottom reaches up to 63 °C, which is way too hot. So using our test model on the lap is possible even when heavy load is applied. But how about the performance after a stress test? We ran 3DMark 06 directly after the stress test. The 15.6-inch notebook then reached 8374 points after the stress test, instead of 8381 points after a cold start. The difference is only about seven points so throttling caused by heat development during high-demanding tasks should not occur here. HP installed the loudspeakers above the keyboard. 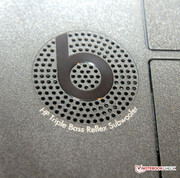 In addition, at the bottom of the multimedia notebook is the HP Triple Bass Reflex subwoofer. The bass shows to advantage and emphasizes the notebook category "multimedia notebook". External loudspeakers can be plugged in via a 3.5mm jack. Alternatively the notebook can be connected with different loudspeaker systems via HDMI. Low energy consumption can tremendously affect the battery life. While using Office, the HP Pavilion m6-1050sg runs very economically with up to 10.1 Watts. The Acer Aspire V3-551G-10468G50Makk consumes only three watts more during idle mode. The energy consumption changes drastically under high-demanding tasks. 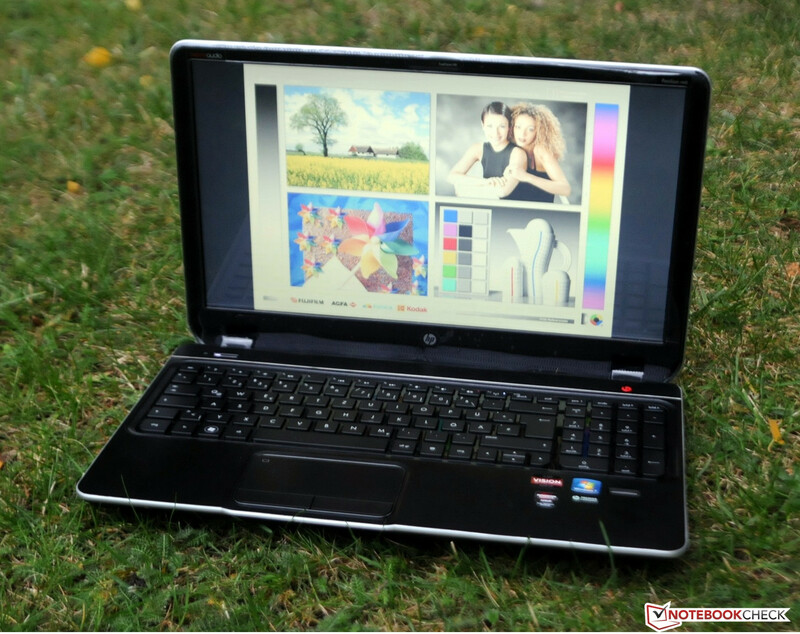 Here the multimedia notebook consumes up to 56 Watts; one of the reasons being the two graphics cards, which run simultaneously under heavy load. So the adapter delivered is absolutely sufficient with its 90 Watts. The energy consumption tells you about the adapter. 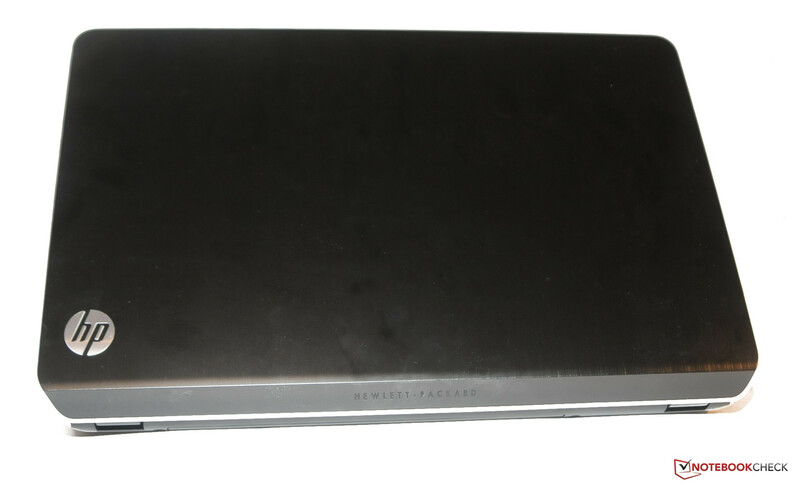 The battery used by HP for this multimedia notebook has a capacity of about 65 Wh. We tested the battery life in three different scenarios. First we determined the maximum battery life. We started the Software Battery Eater in the Readers Test with the minimum performance setting (deactivated WLAN and Bluetooth, lowest level of brightness). The 15.6-inch notebook lasted for about 5 hours and 51 minutes. We simulated internet surfing in a realistic test. We activated WLAN and chose maximum brightness to reach approx. 150 cd/m². 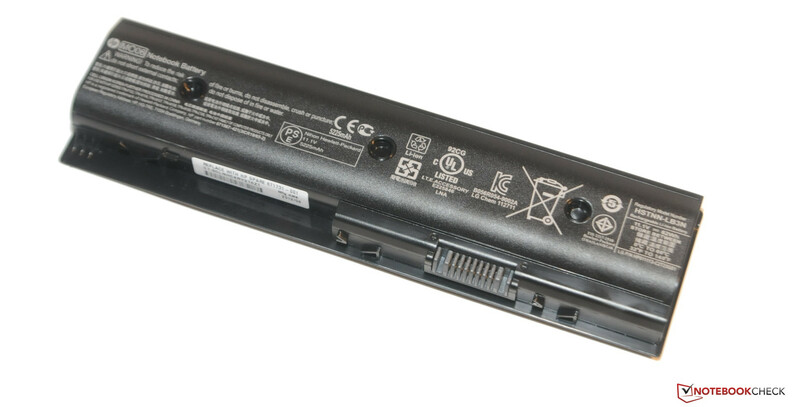 Here, similar to the Acer Aspire V3-551G-10468G50Makk, the battery lasted for 4 hours and 19 minutes. The Fujitsu Lifebook AH532 runs with the Intel Core i5-3210M (2.5 GHz) processor as well as the NVIDIA GeForce GT 640M LE graphics card. With a battery capacity of 48 Wh, the 15.6-inch notebook ran out of energy in the surf test after 3 hours and 28 minutes. In the same test we also tested the battery life under heavy load. We chose the highest performance setting and ran the Battery Eater in the Classic Test. As expected, game over was way earlier. Nevertheless, a running time of 1 hour and 53 minutes does not need to hide (for comparison: Acer Aspire V3-551G-10468G50Makk 1 hour 16 minutes). Altogether, these are good results for a system with a quad-core processor. HP's multimedia notebook HP Pavilion m6-1050sg has an ambivalent verdict. The aluminum housing looks posh and the processor performance of the quad-core AMD A10-4600M is as expected (similar performance as the Intel Core i5-430M). The dual graphics resolution of AMD Radeon HD 7660G + HD 7670M Dual Graphics allows to run current games up to a resolution of 1366x768 pixels at middle detail level. The too small arrow keys are distracting when gaming; however, this is the only point of criticism about the input device. The sound system is quite good too. The display does not convince at all. The reflecting display has very low illumination and weak contrast. Therefore, this multimedia notebook is no good for outdoor usage. Those who can live with a bad display get a solid 15.6-inch large multimedia notebook for 700 Euros (~$906). If you want to invest a bit more, the Asus N56VZ-S4044V is recommendable. Here the customer gets a multimedia notebook with higher performance and a high-quality display for 1000 Euros (~$1295). 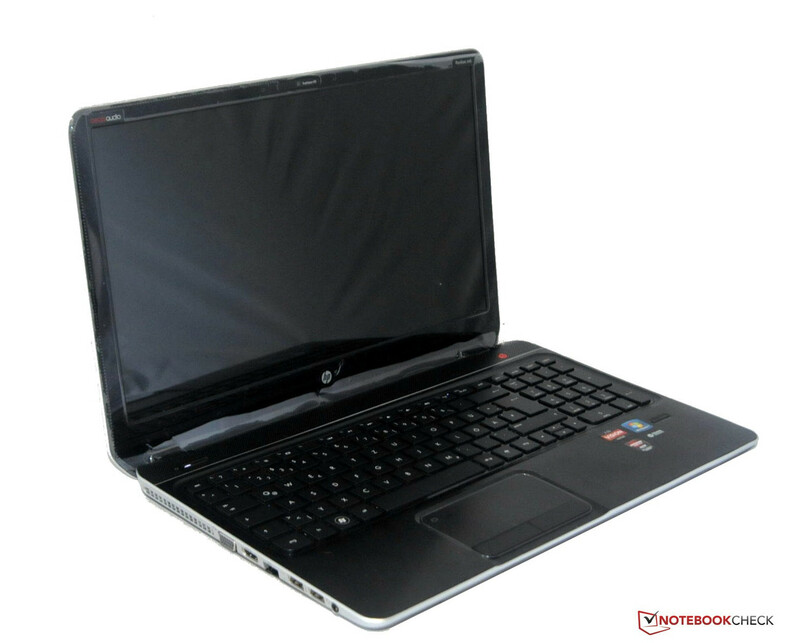 The quad-core processor AMD A10-4600M is the basis of the multimedia notebook. 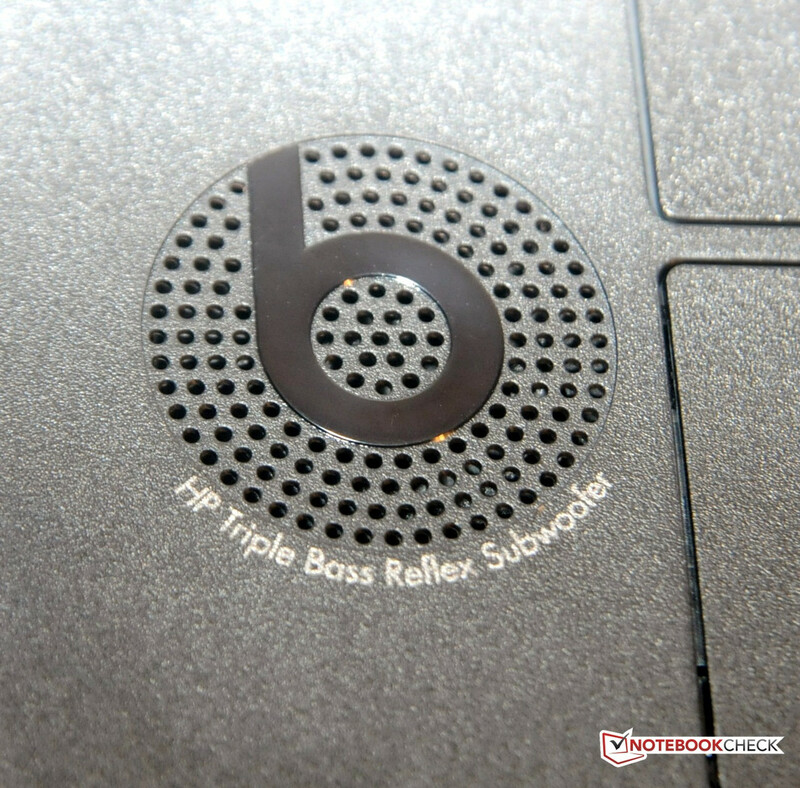 The HP Triple Bass Reflex subwoofer can hardly be heard. The HP Pavilion m6-1050sg even includes a fingerprint reader. The delivered battery has a capacity of 65 Wh. The display lid gets fingerprints quite easily. There is easy access to the inside of the system at the bottom. A chiclet keyboard with complete numeric pad is used. The multimedia notebook weighs 2.4 kg. The built-in display has poor brightness. The 15.6-inch HP Pavilion m6-1050sg has a reflecting display. The HP Pavilion m6-1050sg is an allrounder, however it fails to convince in any particular field. Bigger arrow keys, a convincing display. Bad display for good money.